Though it has been two years since this groundbreaking study was published, as I travel around the country, I am surprised how few educators are aware of this study. That needs to change. After reading this blog post, forward to another colleague who would value and appreciate it! Dr. Patricia Benner and the coauthors of the Carnegie Foundation’s research have been advocating for radical change and transformation in nursing education for almost ten years to better prepare students for the rigors of professional practice. As a result, you would think that nurses who graduate today are better prepared than ever to enter clinical practice settings. But unfortunately, the opposite is true. A study published in 2017 in Nursing Education Perspectives concluded that nursing education is losing ground in the battle for entry-level competency of graduate nurses. 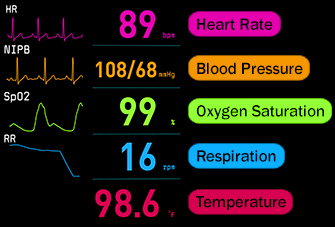 Just because a student passes the NCLEX®, does not currently correlate to practice readiness. Kavanagh and Szweda identified in their study of over 5000 graduate nurses who all passed the NCLEX®, only 23% were able to demonstrate practice readiness by successfully completing entry-level assessments that evaluated basic problem recognition and the ability to think like a nurse using clinical reasoning. 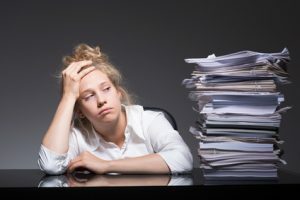 This study is a wake-up call and needed alarm for nursing education to do things differently by embracing and implementing the RADICAL TRANSFORMATION advocated by the Carnegie Foundation’s research published in Educating Nurses in 2010 by Dr. Patricia Benner and her coauthors. This study was conducted by the Cleveland Clinic which is a large health provider system in Ohio that hired and oriented over 1000 new graduate nurses annually over the five years of the study from 2010-2015. These graduate nurses came from 140 different nursing programs in 21 states. These nurses were assessed with performance-based assessments developed by Dorothy del Bueno that are currently used by over 500 hospital systems across the United States. Her assessment uses video and narrative clinical scenarios that assess clinical judgment, problem recognition, management of the problem, resultant priority nursing interventions/rationale. The new nurse has to write an open-ended response to the scenario. There is no multiple choice. 23% new grads were PRACTICE READY by being able to IDENTIFY and then MANAGE a clinical change of status. 54% new grads NOT able to MANAGE the problem once it was identified. 23% new grads NOT able to RECOGNIZE the problem and have a sense of urgency to do something about it. This final result is especially concerning. Twenty-three percent of new nurses were at HIGH risk to contribute to FAILURE to RESCUE because they were unable to interpret clinical data and recognize a change of status that could lead to an adverse outcome including patient death. Put another way, what happens in academia doesn’t stay in academia. Once nurses graduate they will impact patient outcomes either for better or for worse. If you are a nurse educator, the stakes are just as high as if you were in clinical practice. When you were a nurse at the bedside, the clinical decisions, and judgments that you made directly impacted the outcome and well-being of your patients. Nothing has changed now that you are an educator though detached in one way from the clinical setting. Every one of your students is going to graduate and enter clinical practice. If graduate nurses in your program are not practice ready, it is literally a matter of life and death. As an early adopter of the paradigm shifts advocated by Dr. Patricia Benner in Educating Nurses, I help nurse educators integrate clinical reasoning in the class and clinical settings by creating numerous tools and strategies. I made it a priority to get educators to just utilize the tools that I had developed. Use the tools and your content can be transformed! I learned that before tools can be effectively integrated, there is something much more important that needs to take place. The educator needs to be transformed by thinking differently about nursing education. It is not what you DO, but how you need to THINK. Let me give you an example. If I were to ask you what is the overriding objective that defines your program, how would you answer? I have observed that nurse educators and programs are focused on the pass rates of the NCLEX®. But is that the endgame of nursing education…to pass a multiple choice test? This emphasis needs to change. The ultimate endpoint of nursing education is not passing the NCLEX®. It is about preparing students for real-world clinical practice so they are able to clinically reason by making correct clinical judgments. NCLEX® pass rates are a simplistic definition of success (Kavanagh & Szweda, 2017). Instead, educators need to look at as equally important the ability of graduate nurses to use and apply knowledge and be able to clinically reason (Benner, Sutphen, Leonard, & Day, 2010). This is why infobesity needs to be eliminated from your curriculum and emphasize deep learning of what is most important to first-year generalist practice. 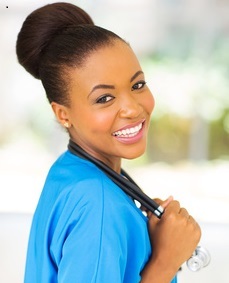 When nursing students are able to understand and apply what is most important, then integrate the nurse thinking skill of clinical reasoning they will not only pass the NCLEX® but more importantly, will be well prepared for clinical practice. What is your educational philosophy as a nurse educator? What standard do you consistently keep before you that influences all that you do as an educator…getting students to pass the tests in your program and then the NCLEX® or doing what is needed to practically prepare them for clinical practice? Do you live out your philosophy? It’s not what you believe that matters but what you do. Does your classroom and clinical teaching reflect educational best practice by decreasing the amount of content that you teach and implement active learning that provides opportunities to use and apply knowledge and emphasizes clinical reasoning consistently? I recognized the need to create resources that would not only implement the paradigm shifts advocated by Educating Nurses, but also help students get better prepared for clinical practice. 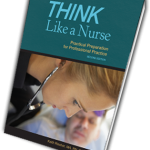 That is why I have developed the numerous case studies that are available on my website, as well as the student text THINK Like a Nurse: Practical Preparation for Professional Practice. 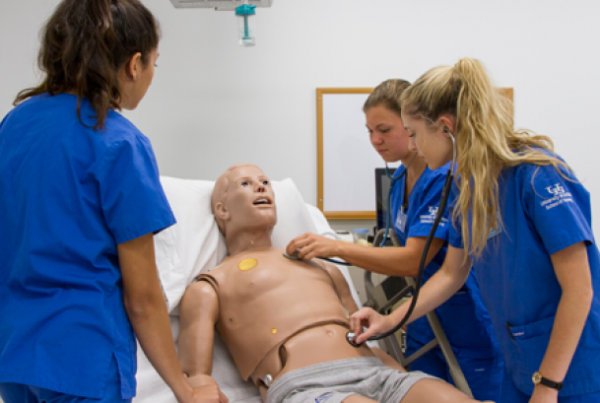 Nursing education is losing ground in the quest to prepare students for real-world practice. The traditional ways that nursing have been taught and the way that nurse educators think about nursing education need to be changed and transformed by a new paradigm. Every nurse educator is on a journey. Thinking differently by balancing NCLEX success with preparing students for practice is the first step out of the wilderness that will take you into the promised land of transformational change! Identify, then take that first step today! Why is nursing education struggling to better prepare students for professional practice? Kavanagh, J. & Szweda, C. (2017). A crisis in competency: The strategic and ethical imperative to assessing new graduate nurses’ clinical reasoning. Nursing Education Perspectives, 38(2), 57-61. 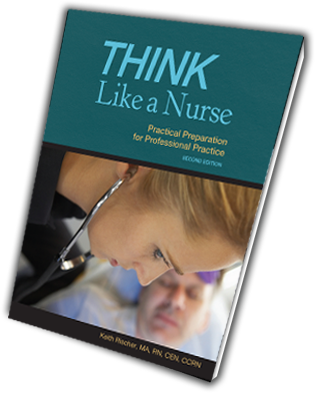 THINK Like a Nurse: Practical Preparation for Professional Practice will help your students get practice ready! Programs across the country have successfully adopted. Contact me to see how easy it can be to get this resource in your program. See for yourself what educators and students are saying on Amazon.